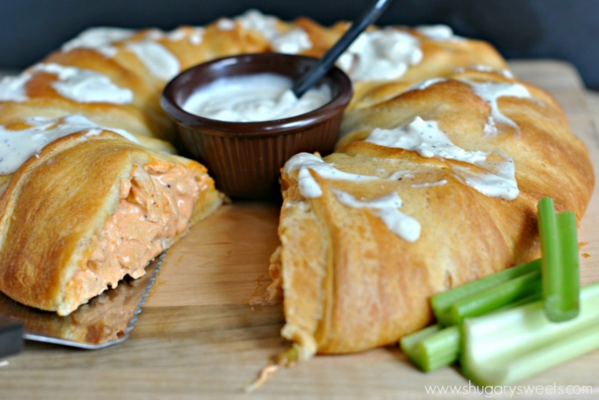 Crescent roll dough is so easy to work and versatile! Bored with your same-ol' same-ol' appetizers? Try these savory stuffed crescent rolls and watch your knees BUCKLE. So here's the scene. You've been invited to a party and you have to come up with a crowd-pleasing appetizer to contribute. You're bored to the bone with the staple cheese and cracker plate. And you're seriously falling asleep into your bleh to the blah hummus dip. So take some Pillsbury crescent rolls, stuff them with your favorite savory filling, and you'll be asupe-ah-stah at your next get together! Head to Tablespoon for this delicious recipe! Delicious and crowd­pleasing, Mom's Spinach Crescents are one of my most asked­for dishes when we visit friends and family. This is the best and easiest spinach appetizer ever. The secret is in the mix. 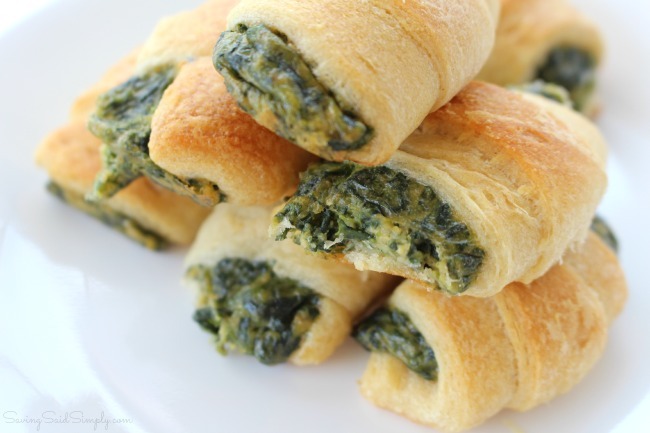 This delicious spinach crescent is perfect perfect to serve for any crowd and easy enough to whip up multiple batches. All you need is some frozen chopped spinach, velveeta cheese, garlic, breadcrumbs, and cans of crescent rolls. This recipe is pretty much fool proof. Head to Raising Whahsians for this recipe and directions. 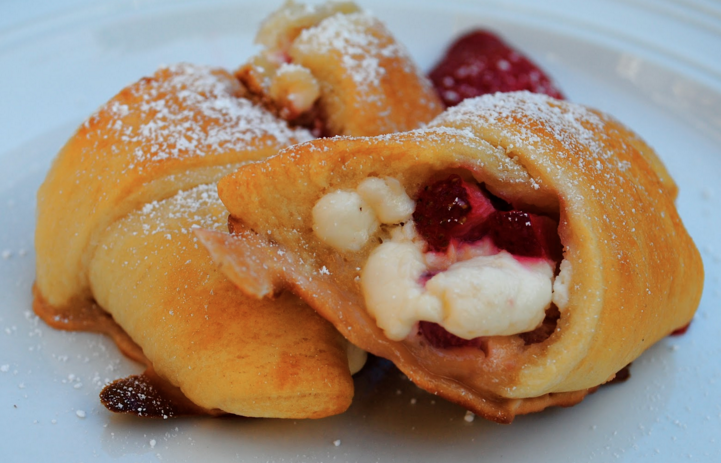 These strawberry cream cheese crescent rolls will have everyone drooling and begging for more. The best part is they are so easy to make and requires so few ingredients. All you need are some strawberries, a can of crescent rolls, cream cheese, sugar, and vanilla extract. 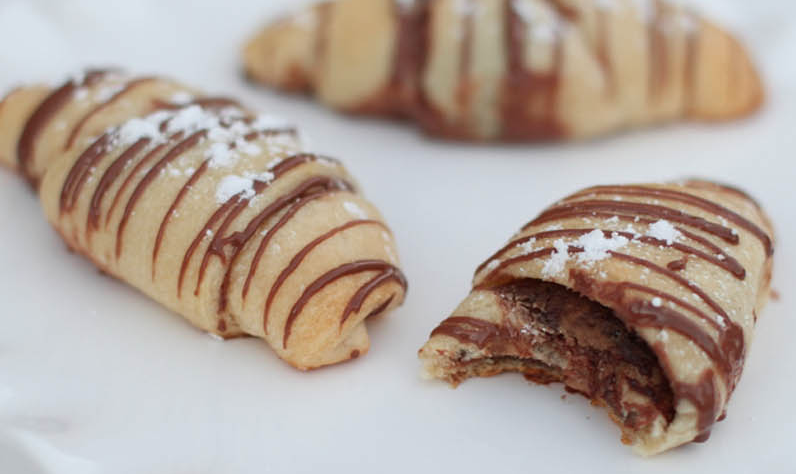 These would make a great breakfast, snack or dessert. Yesterday, I married my day old strawberries with some store bought crescent dough. With the addition of light cream cheese, sugar and vanilla, these rolled up pastries turned out scrumptious (but a little messy). They only take about 5 minutes to make, and out of the eight I produced, only one is left after breakfast today! Head over to Virtually Homemade for this great recipe. Now that the weather is starting to cool down a bit, I’ve been craving hearty, meaty casseroles that fill me up and warm me from the inside out. 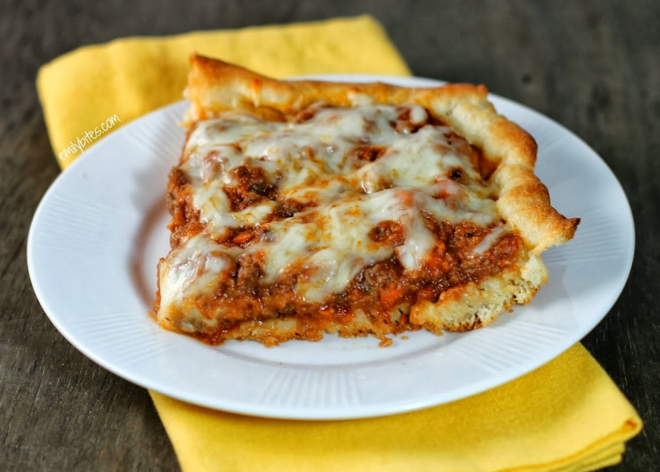 The pizza crust is bursting with rich, saucy meat and melty cheese, and the edges of the dough get nice and crusty. These are really nice, filling servings too; perfect comfort food for a chilly day! Oh and by the way you can use a can of cresent rolls instead of pizza dough. This recipe is pretty versitale and you can swap out ground turkey or chicken meat for beef, and sub in or out any of the seasonings to your liking. Head over to Emily Bites to get her delicous recipe and directions. The cheese melts with the chicken and broccoli and creates a savory, delicious filling between a soft and crispy crescent roll crust! While my daughter and I we were visiting my parents a few weeks ago, my mother decided to whip up a little afternoon snack. After she closed the refrigerator door, I saw that she had a canister of crescent rolls, a bag of sliced chicken lunch meat, shredded cheese and broccoli in her arms and wondered what on earth she was going to serve us! She began to explain the concept of chicken and broccoli wraps, but made with crescent rolls. As she started putting it together, I knew it was going to be another one of mom’s successes! 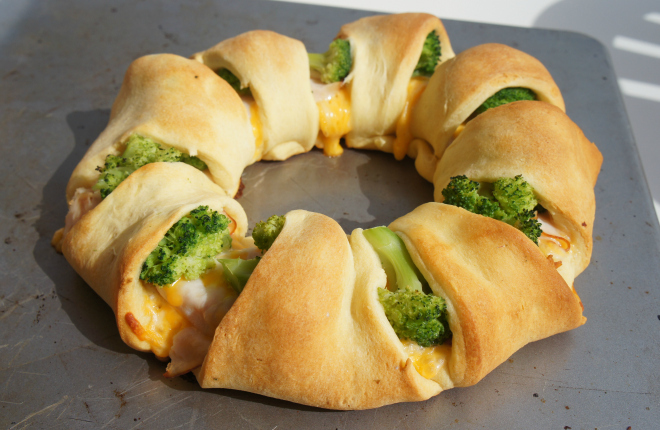 This chicken broccoli crescent roll recipe is perfect for making for an afternoon get-together, as an appetizer for a party, or even to put into your children’s lunch boxes. Head to Parent Pretty for this delicious recipe! A cronut is the crossing of a croissant and a doughnut…two of my all time favorite things. I probably lost you at croissant; croissants are a LOT of work. 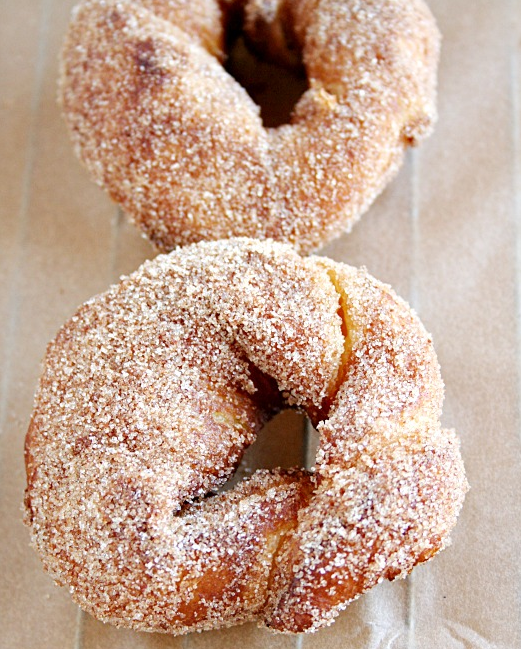 But have no fear, I have a GREAT cheat for you…hence the faux in faux cronuts. Roll’em up. Fry them in oil. Toss in cinnamon and sugar. DONE! You NEED to do this. Yes, they require a bit of exercise afterwards, but are completely worth every single calorie! Head over to Heather's French Press for the exact directions and instructions on how to make your very own delicious cronuts! Tacos on a stick? Sure thing, with Crescent Rolls and a little taco filling. 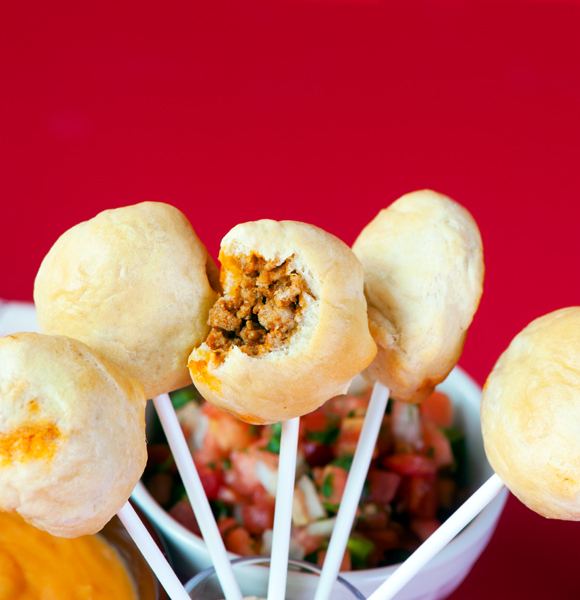 These Taco Pops will be a fabulous addition to your celebration, but they're not only a great little appetizer—they’re also great for a quick, fun snack or kid lunch. A word of caution though—make more than you think you’ll need. A double batch may be in order. I ate five in the course of taking photographs without even realizing it! Also, this is a great way to repurpose those taco night leftovers. These pops are so easy to make. You’ll need about a cup of prepared taco filling (I used ground turkey with Old El Paso taco seasoning) and one package of Pillsbury Crescent rolls. Head over to Tablespoon for more directions and details! With this recipe you can have a yummy dessert prepared and cooked in 15 minutes. That’s my kind of dessert! Head over to I Heart Naptime for this easy treat. PHILADELPHIA Cream Cheese is made from fresh local milk and real wholesome cream. It comes to your grocery store in just six days, now that’s fresh! I use PHILADELPHIA Cream Cheese for all my baking because I find that it always gives me perfect results: creamy, decadent results! 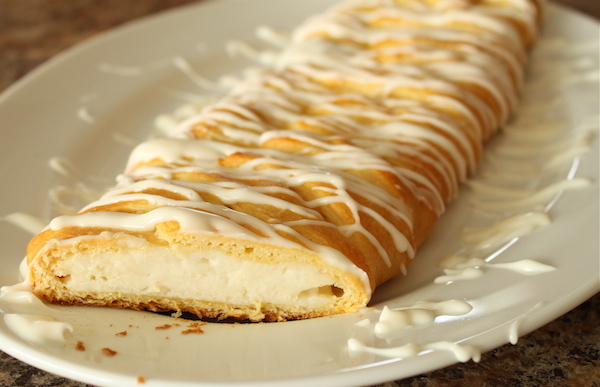 Head to Shugary Sweets for this creamy and delicious recipe. This recipe not only tastes amazing, but it looks amazing too! 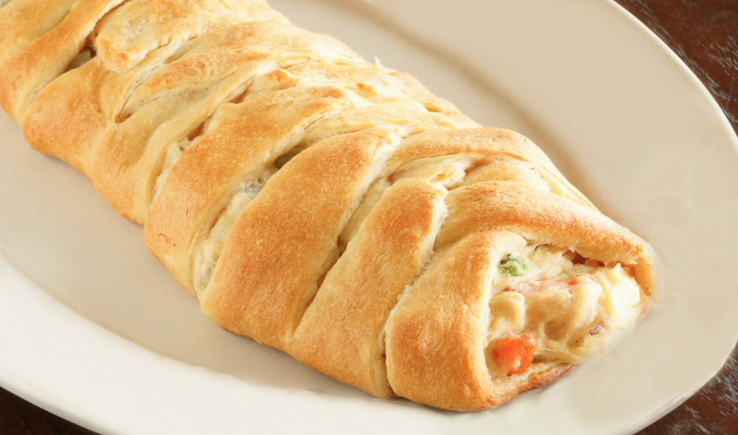 Chicken pot pie wrapped up in a gorgeous crescent braid. Simply delicious and your whole family will love eating this. People will be begging you for this simple recipe. All you need to make this dish is a package seamless crescent roll dough, some precooked shredded chicken, frozen peas and carrots, shredded Cheddar cheese, cream cheese, softened, and canned cream of chicken soup (or homemamde). Head over to Sparkle Markets to find more details about this amazing recipe. This is my new go-to recipe for pecan bars. These pecan bars are are unique in that the crust is made from a can of refrigerated crescent rolls. The crescent rolls make this recipe simple and quick to prepare. 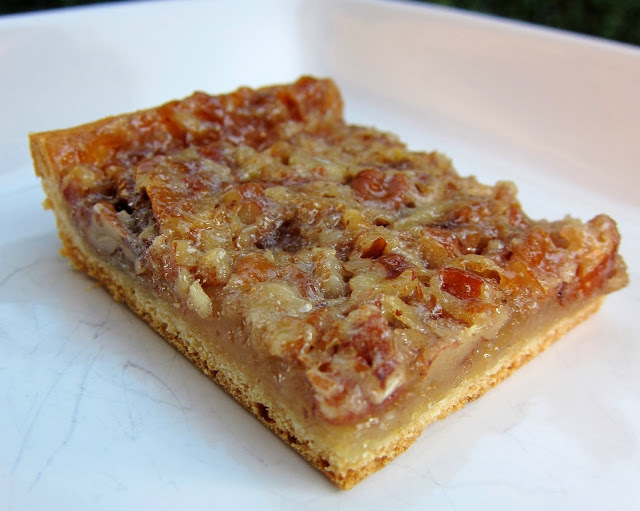 The pecan bars tasted just as good, if not better, than our usual pecan pie and were much easier to make. I took these to our tailgate and they were a huge hit. I am planning on making these for our Thanksgiving feast later this month. They are dangerously delicious! Head to The Plain Chicken for this amazing recipe! These little piggies are my kryptonite. I can not control myself around them! I just keep popping them in my mouth. *oink* *oink* They are SOOOO good! I could seriously make a meal out of them. 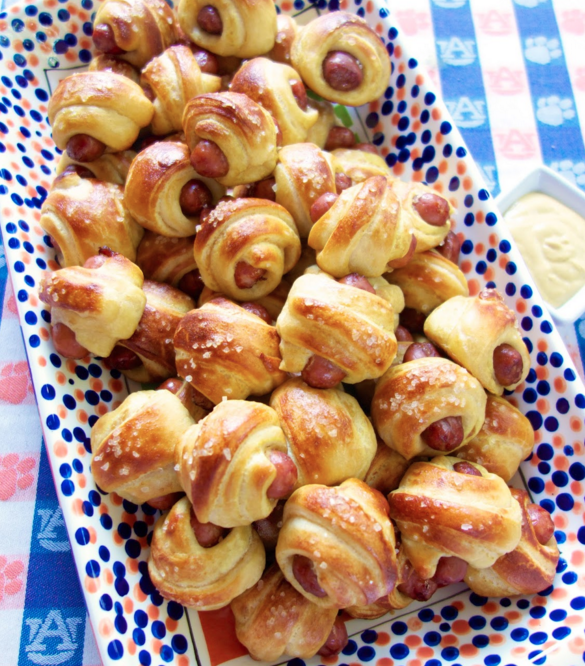 These Pretzel Pigs in a Blanket use refrigerated crescent rolls for the dough. The assembled pigs take a quick bath in a baking soda and water mixture before going in the oven. The baking soda and water mixture is what gives them the pretzel texture. Such a quick and simple step to transform our usual pigs in a blanket into something amazing! Head over to Plain Chicken to get this delicious recipe! Today’s post is a result from finding crescent rolls and a miscellaneous package of cream cheese in my fridge. I usually never make plain crescent rolls. I always have to make something cooler than that! So, I made a danish of sorts. It’s technically not a danish, but it looks like one and tastes pretty close, so it’s a fake out recipe! Did I mention it takes 10 minutes or less to make? With only 4 ingredients? Well, it does. My kind of treat. Scroll down to see all the ‘how to’ photos to see what little effort this takes! Head over to Lauren's Latest for this amazing recipe! Yes, it’s that time of year – the leaves are turning (too early, if you ask me), the mornings are starting to get that delightful little nip in the air, and the entire world is obsessed with pumpkin. Myself included. This was my first pumpkin foray of the year, for a brunch at a friend’s house. 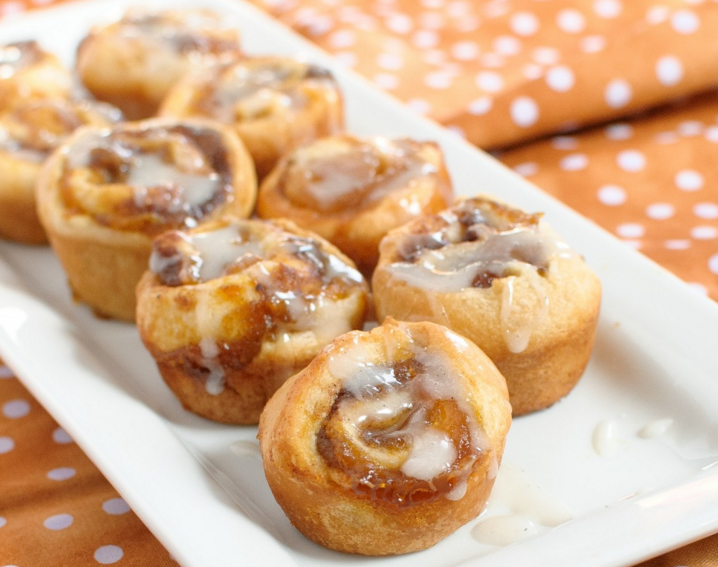 They are incredibly simple, due to the cheat factor with refrigerated crescent dough (but you don’t have to tell anyone that), and they have all the warm, gooey appeal of a regular cinnamon roll, but with an extra pumpkin punch. Assemble in five minutes, bake in 15-20, and you’re good to go. You can bring these to brunch, to work, or just pop them like candy in the privacy of your own kitchen. I highly encourage popping them like candy – it’s so easy to just whip up another batch when you do. Head to Baked In for this easy recipe. If you have spent any time at all at Mess for Less then you know that crescent rolls and I are friends. Good friends. There are so many family friendly recipes you can make with store bought crescent rolls, whether you are looking for a sweet or savory treat. Plus they are loved by kids, always a win in my house. We have made more crescent roll recipes than you can shake a stick at such as Pepperoni Pizza Crescents and Peach Pie Crescents. 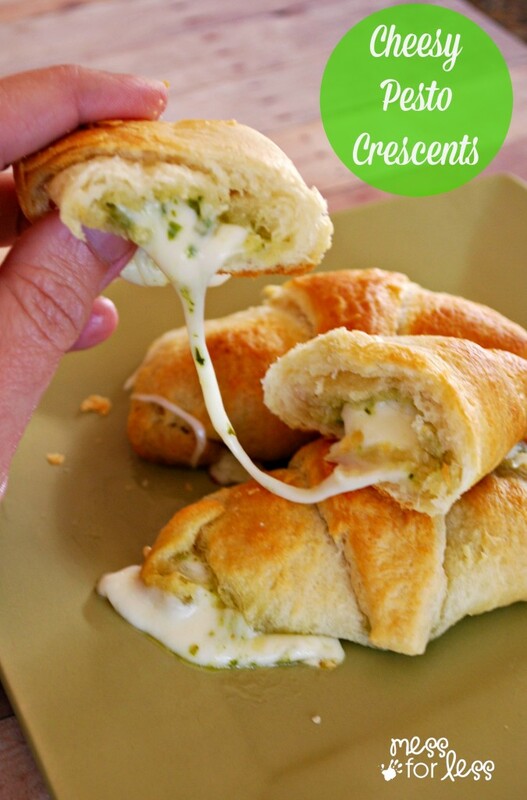 Today, I am combining three of my favorite ingredients: crescent rolls, cheese and pesto for these simple Cheesy Pesto Crescents. 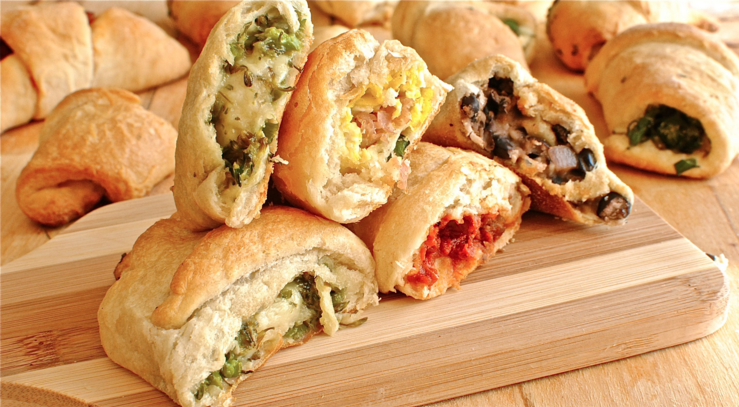 Head over to Mess for Less for directions on how to make these delicious savory treats!